Some beautiful genius deserves credit for this. If I had the time I would bravely sift through years of Instagram and peel back layers of Pinterest until just one picture remained. When that day comes I will give credit where credit is due. Until then, that hero will remain unnamed, safe in the knowledge that they made the world a better place. Breakfast is easily the best meal. First of all there’s coffee, that’s awesome. That’s a blog post alone. Shoot, making the perfect cup of coffee is an entire industry. I’ll leave it be. For now. Then, amongst the cacophony of choices, there is the humble chicken’s egg. It rises like the phoenix above all matters of parfaits and home made muesli bars. A perfectly prepared egg is easily the third most photographed thing on the internet. Check out #eggporn for a good time. One of the things I love about this dish is that the potatoes are used to keep the avocados from tipping over during the cook. Practical engineering in the kitchen. I think. I’m not an engineer. This all leads us to a remarkably simple and elevated way to serve a pair of eggs. Perfect these and your lady friend might stick around for all of Sunday Funday. Start by dicing your potatoes and tossing in olive oil, salt and pepper. Lay them in a single layer on a baking sheet and get them in the oven. Set a timer for 20 minutes. Get to work on the avocado. Slice in half and remove the seed. 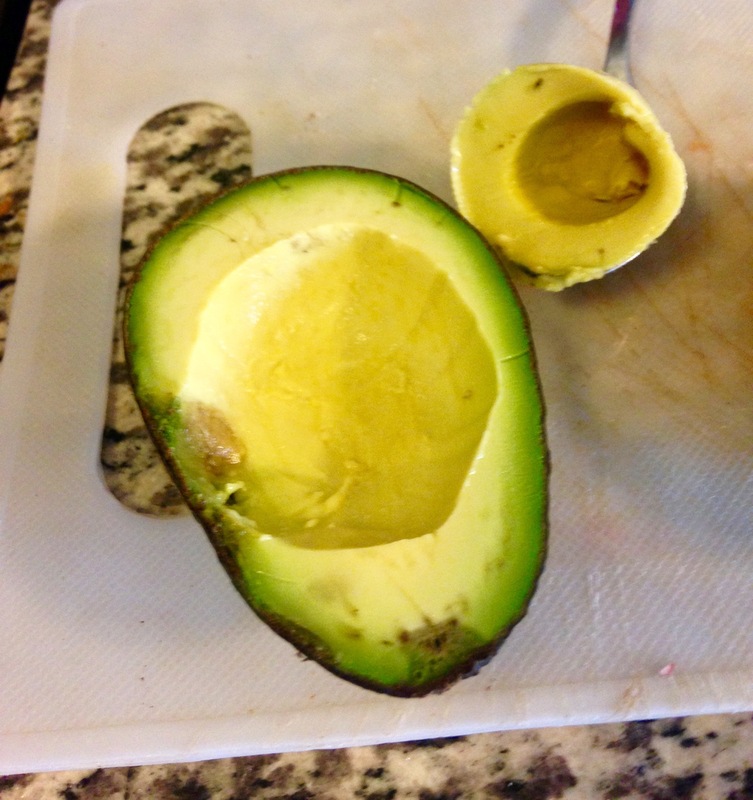 Using a spoon, scoop out enough avocado to fit the volume of the egg inside. Might be more than you think, at least two spoonfuls. 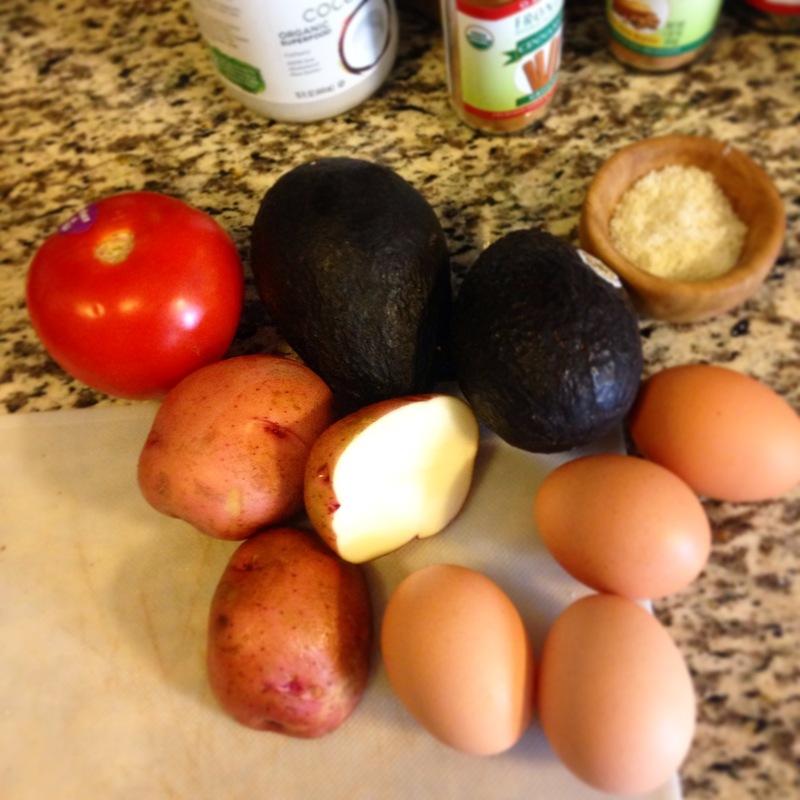 Splash a pinch of salt and pepper on the avocado and wait out the timer on the potatoes. 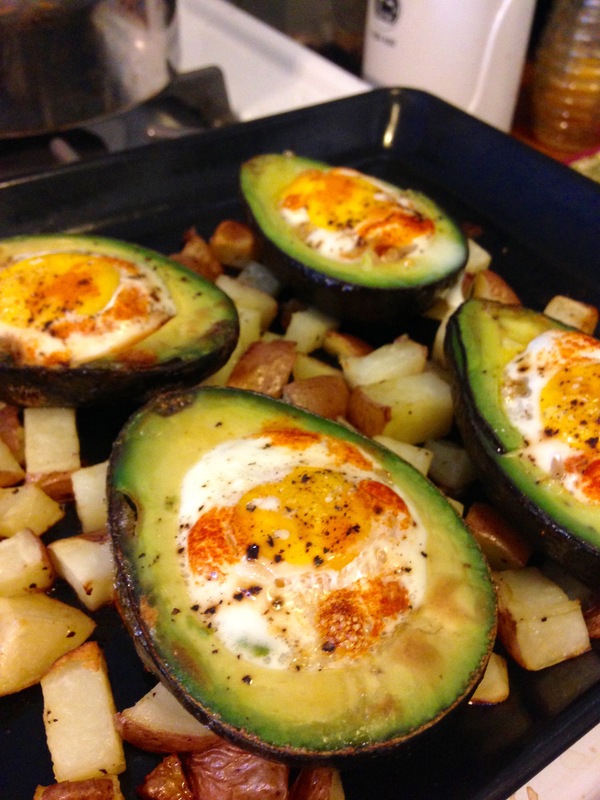 Once those are half done, using a good potholder, take the sheet pan out of the oven and push the potatoes around so you can set the avocados on the sheet without them tipping and rolling around. 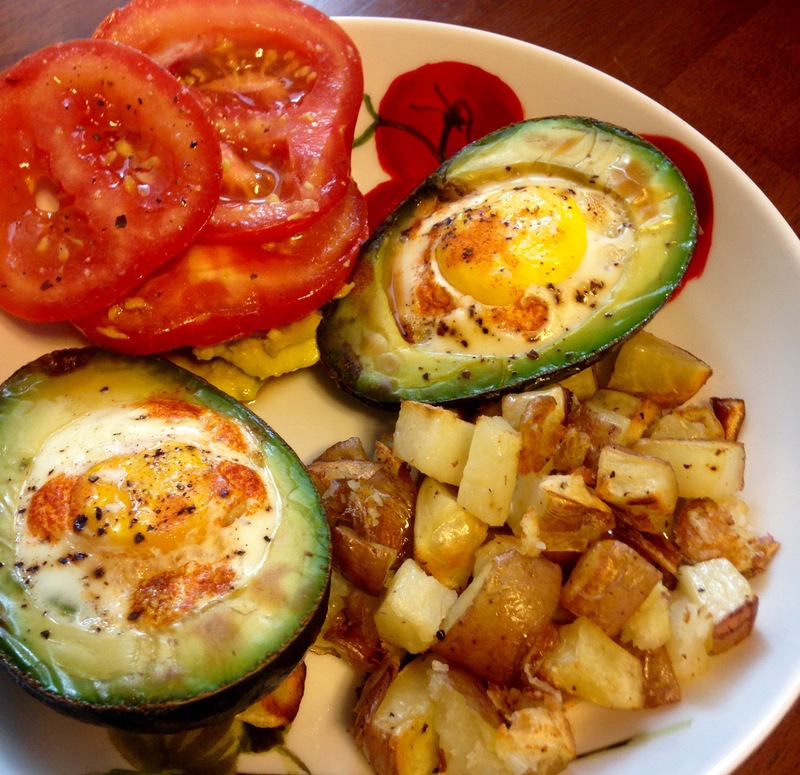 Crack one egg into each half an avocado. Have a small bowl standing by in case you start to overflow and panic. 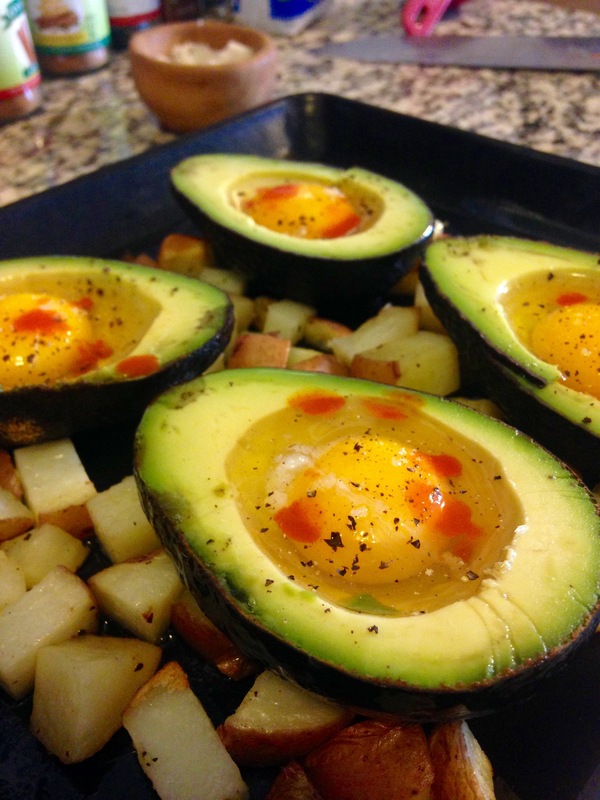 Just pour the egg into the bowl and scoop a little more avo out. Once the avocados are filled and propped up, dash some hot sauce on them and put them back in the oven. Set a timer for 15 minutes. Slice up that tomato and drizzle with some olive oil and salt and pepper. Set that up with the excess avocado on your serving plates. When the 15 minutes are up pull out the pan and take a look. The whites should be set and the yolks still soft. The air bubbles in the yolk cook translucent, don’t be fooled by the clear. I usually poke the white with a fork. Remove from oven, dash of salt and pepper on each. Serve with the fresh tomatoes and roasted potatoes. Wow I must try this! Let me know how it come out!